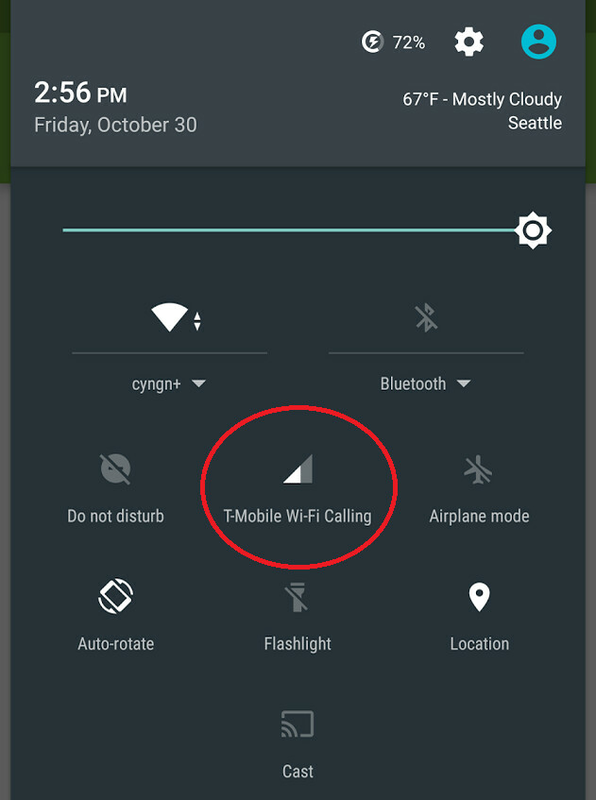 CyanogenMod 13 to support T-Mobile's Wi-Fi calling? A screenshot of CyanogenMod 13, snapped by a Cyanogen employee, reveals that the Android ROM will come with support for T-Mobile's Wi-Fi calling. Roman Birg, the gentleman who punches his time card every day at Cyanogen, said that the inclusion of T-Mobile's Wi-Fi calling came from using AOSP code (Android Open Source Project) combined with what he calls "clever trickery" by the Cyanogen team. CyanogenMod 13 is based on Android 6.0 Marshmallow, and a release date for the ROM is not yet known. We could start to see alpha and beta versions of the latest Cyanogen build surface within months. T-Mobile's Wi-Fi calling allows T-Mobile subscribers who are stuck in an area with a poor cellular connection, to make and take phone calls over a Wi-Fi network. It also allows for the sending and receiving of texts over a Wi-Fi network as well. Having the feature on CM13 might give T-Mobile subscribers who like to customize their Android phone, the impetus to flash Cyanogen on their handset. Well duh, Android supports WiFi calling natively now. This is not surprising at all. yes but does it support the required registration natively for said network. That is why it isn't as simple as boom there it is. Cyanogen its just too overrated.. There are lots of better custom Roms, more stable and with more feautures. And many of them use CM as their base. Gotta start from somewhere, and CM is a good place to start. Man CM roms are less than AOSP. And trust me, u get lot more AOSP custom kernels than CM custom kernels. Its just too overrated, u can't deny that. I don't deny that. When I first got my Nexus 4 (2 years after release), I tried nearly 30 custom ROMs and ended up with LiquidSmooth KK, which is based on Slim, which is based on AOSP. Run it on my OPO too. I'm thinking of trying BlissPop on at least one of them, a very popular ROM, which I believe is based on CM, or at least borrows a lot of CM elements. Pretty much ever custom ROM, be it AOSP or CM or CM based borrows from everybody else.